The research report on frameless brushless DC motor market covers product portfolios, pipeline analysis of key companies, their strategies to maintain their present scenario in the market, their global presence and future expansion plans, mergers and acquisitions, distribution channel analysis, pricing analysis, product positioning tactics, etc. An entire section is dedicated to the competitive landscape, which includes information on the key players in the frameless brushless DC motor market both from the manufacturing side as well as the demand side. Alongside competitive scenario, the research report also focuses on the application side. The end user analysis is equally important as they are the revenue generators in the market. With this analyses, it would be easier to identify potential prospects, understand their behavior, spending power etc. The end user intelligence provides insights that can be used to devise strategies in order to achieve growth and tap more revenue pockets. The research report on frameless brushless DC motor market provides exhaustive analysis on market share, demand and supply analysis, sales volume and value analysis of various products, competition etc., with respect to important geographies of North America, Europe, Asia Pacific (APAC), Latin America, and Middle East and Africa (MEA) along with a regional breakdown. These regions are analyzed keeping in view several aspects that influence the growth of the frameless brushless DC motor market. The report contains an outline of forces that affect the global market scenario. Porter’s Five Forces analysis is also covered along with PESTEL analysis for the regions covered. This gives an idea of how to plan market entry strategies, establish connect with various customers and target audience and to establish a foothold in that area. The unbiased holistic 3600 view of the frameless brushless DC motor market is what the research report puts forth and assists in making informed decisions basis the market survey. For every research, a plan is essential to make it more fruitful. A more robust, unique and effective research methodology is followed in the market study that enables a near 100 percent accuracy from all angles. The research process uses primary research, secondary research and expert opinions to get a thorough understanding of the market. Initial secondary research is used to understand and analyze a broad view of the market, basis which primary interviews are conducted and data is gathered. Expert opinions are also tabulated and the data is cross verified. Each data point is rechecked and re-evaluated as the primary interview progresses. This enables the analysts to craft the research report with optimum accuracy. With this study it is possible to obtain actionable intelligence that can be used in the execution phase directly. An extensive segmentation is mapped during the research around the frameless brushless DC motor market. This ensures that all angles are covered in the research making it even more credible giving a realistic view of the market with an all-inclusive feature. Each organization has its own integral research team. Persistence Market Research extends support to organizations by doing all the heavy weight lifting and coordinating with their research teams to assist them in their tasks and overcome their challenges. Our report offers an unbiased third party opinion and explores every facet of the market that can be used as a tool to gain competitive edge. From product idealization to product launch and extending to product commercialization – the report adds huge value. Some of the features of our report include expert opinions and recommendations for valuable insights and a thorough analysis of the trends and opportunities shaping the market. 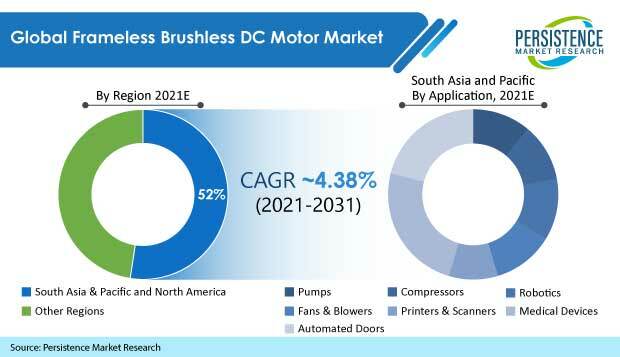 The exhaustive research report titled “Frameless Brushless DC Motor Market: Global Industry Analysis 2012-2016 and Forecast 2017-2025” will give a broad spectrum of all the aspects involved along with forecasts to identify major revenue pockets in the future as well. According to Persistence Market Research, the global frameless brushless DC motor market is estimated to be valued at almost US$ 8,400 Mn in 2017 and is expected to reach a value of about US$ 12,000 Mn by 2025 at a CAGR of 4.6% over the 2017-2025 period. This significant growth is likely to be influenced by several key trends expected to emerge in the global frameless brushless DC motor market in the coming years. There are several aspects that influence the global market scenario. Several trends and opportunities have been observed in different regions and in different application areas. The market witnesses wide adoption of high performance cars especially in the developing countries and hence manufacturers are focusing primarily on providing an entire range of frameless brushless DC motors for this purpose. Moreover, there is a large presence of local and regional players and the number is still rising. The strategic collaborations taking place to achieve regional advantage is a key trend observed in this market. The light weight of frameless brushless DC motors adds more value to their use and adoption. This is one of the aspects driving the global market. Another trend observed in this market is that many companies are focusing on higher efficiency and low energy consumption, which is possible with the help of frameless brushless DC motors. Moreover, the increasing use of robots owing to increased automation requires these motors, accelerating their use even further. The attractiveness of these motors can be credited to their longer life cycle and high efficiency due to less weight. Asia Pacific (APAC) region seems to have good growth potential and in the coming years is poised to grow at the highest CAGR of 5.5% by value and 4.9% by volume. This growth can be attributed to the increasing demand in China and Japan. Investing in Asia Pacific seems to be an intelligent move towards achieving profitable expansion. Following Asia Pacific, North America is second in line as far as lucrativeness of the market is concerned. The North America regional market is poised to reflect a value CAGR of 4.9% and by volume a CAGR of 4.2% in the period 2017-2025. United States and Canada are major contributors in terms of demand generation in North America. Europe is expected to show moderate growth during the forecast period. In the Asia Pacific region, China seems to show the highest growth rate followed by Japan and India. The medical devices segment by application type is poised to grow at a significant rate showing a CAGR of 5.1% by value and a CAGR of 4.6% by volume. The robotics segment seems to occupy second place in terms of growth rate showing a CAGR of 5.0% by value and CAGR of 4.2% by volume. The global frameless brushless DC motor market growth rate by application is also impacted by the printers and scanners segment. The robotics segment will create an incremental opportunity of more than US$ 590 Mn in the forecasted period. The medical devices and printers and scanners segments will record incremental opportunity of more than US$ 955 Mn and more than US$ 400 Mn respectively.